Every week, I get an email from United Airlines telling me about their e-fares for the coming weekend. Almost every week, I ignore this email because the information isn’t relevant to me. 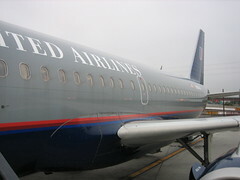 This week’s email includes fares from Burbank to San Francisco, Wichita to Denver and White Plains to Chicago. United knows that I live in the DC area. United also knows (from having years of my frequent flier history) the places I go to frequently. If they used all that data to only send me relevant offers, I’d be more likely to read their email. If they highlighted deals to San Francisco or Seattle, there’s a very good chance I’ll bite. Despite all the talk about companies using mass stores of data to provide laser-targeted offers, the reality is far from it. United isn’t alone. American Express has 14 years of my purchasing history, yet not one of the six “CustomExtras” offers on my last statement was relevant. I’m even willing to give United more data than they already have. I’d be happy to fill out a form listing all the places I want to go. Have a last-minute bargain to Prague or Istanbul or Sydney? Sign me up. I’m glad to help you fill those empty seats. United doesn’t even have the challenge of developing custom creative — all they need is the city and the price. This entry was posted in advertising, email, personalization, travel. Bookmark the permalink. I couldn’t agree more rocky. They’re just lazy. I ahve the same situation with Qantas in Australia. Not one tailored offer in 12 years. They know where I travel, even the sports I am into and have’t once given me a relevant offer. In fact, there’s a realy opportunity for a marketing person with some initiative in one of these firms to make themselves shine. Looks like there are plenty of job opportunities with airline and credit card companies marketing departments! LH (lufthansa) joining the queue. Their offers don’t even have there starting points in the country I am living in. To take up one of their offers to fly cheaply across Europe I have to first travel from Germany to the Netherlands in order to catch one of the bargain flights.